LIMA, Peru (AP) -- A day after a court imposed a 25-year sentence on former President Alberto Fujimori in death squad killings, his daughter predicted Wednesday that the ruling would backfire as she launched a "national crusade" to clear his name. "I think this very harsh verdict will be a boomerang," said Rep. Keiko Fujimori, a presidential hopeful in 2001 elections. "If they thought they would defeat Fujimorism with this, they're all wrong." Keiko also said there was no truth to rumors she is discussing a possible pardon with President Alan Garcia, who has been silent on the issue. Tuesday's conviction and sentencing of her 70-year-old father for 1990s death squad killings and forced disappearances have thrust Keiko into the spotlight. Immediately after the verdict, she called it "vengeful" and predicted public outrage would propel her to Peru's presidency. If elected, she has said, she would pardon her father. Keiko, who became Peru's first lady at age 19 after her parents divorced, won the most votes of any candidate in 2006 congressional elections. She told reporters Wednesday that she plans "a great crusade to clear the name of Alberto Fujimori." "We want to go to the most remote villages, above all those that suffered the scourge of terrorism and let it be known how unjust this verdict is." A three-judge Supreme Court panel found Alberto Fujimori guilty of 25 murders in two operations by a military hit squad it said was created to fight the terror of the Shining Path insurgency with state-organized terror. There was no question, the court found, that Fujimori authorized the hit squad's creation. Keiko said she has collected the signatures of 700,000 people who back her father and has set a goal of obtaining 1 million. The oldest of Fujimori's four children, she is among three front-runners in recent polls for president. Her popularity owes in part to her father's legacy as the man who rescued Peru from the brink of economic and political collapse after winning office in 1990 as a political unknown. But many analysts say her appeal is limited. Her Fuerza 2011 party has just 13 seats in the 120-member congress and Nelson Manrique, a Catholic University professor, believes she has been weakened by the strong judicial condemnation of her father. "It's one thing to capitalize on the romantic image of the daughter defending a presumably innocent father, another defending a sentenced criminal," he said. Experts in international human rights law say the verdict is precedent-setting and could have profound implications for other former or current heads of state who may have committed similar crimes. It is the first in which a democratically elected former president has been tried in his home country for rights violations. In addition to the death squad killings, Fujimori was convicted of two kidnappings. One of the victims, investigative journalist Gustavo Gorriti, was abducted for a day in April 1992 for criticizing Fujimori's shuttering of the opposition-led Congress and courts. 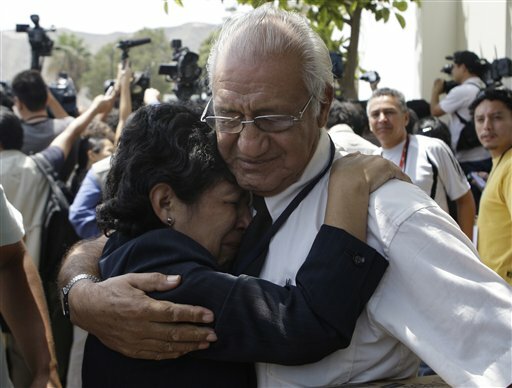 He told The Associated Press that there was "a certain fallacy" to Keiko's "supposed great popularity," noting that two-thirds of Peruvians had deemed her father guilty in pre-verdict polls. Keiko has no more than 24 percent support, he estimated, and her candidacy is "essentially single-issue: Fujimori's freedom." Fujimori's 10-year presidency ended in disgrace in 2000 when videotapes showed his now-imprisoned intelligence chief, Vladimiro Montesinos, bribing lawmakers and businessmen. Fujimori fled to Japan, then attempted a return five years later via Chile, believing he could make a political comeback. Instead, he was extradited.